Now this isn’t so much a recipe as a collection of foods but even though I have been cooking and eating the Full English for many years this was the first time I felt I had managed to get everything just perfect! The most challenging part of the whole thing for me has always been the fried egg. I’m too impatient. Today I finally cracked it! I have to admit that I didn’t actually cook the fried bread this time, I left it in my mother’s capable hands. Hers is always much better than mine in any event! -Sausages go in first. I grill then under a fairly high heat. -The fried bread wants to go on next. Cut your bread into triangles then pass one side under the cold tap. Put into a frying pan of fairly hot oil (about 3tbsp) then turn down a bit and leave til the first side is a golden brown. Then flip over and brown the other side. -When the sausages are brown on one side turn them over and add your bacon to the grill pan with them and turn down the heat to medium. If grilling tomatoes as well put them in here as well skin side up then turn later. -Put the baked beans in a microwavable bowl with a knob of butter and cover with clingfilm. Microwave on full power for 2 1/2 minutes. -Heat a few tbsp oil in another frying pan to fairly hot then turn down to low. Crack the egg into a small bowl or saucer. Slide it from the bowl into the pan. Cook for a few minutes until the white is set. Spoon the hot oil over the top of the yolk until it reaches the way you like it. – If necessary give the beans another minute in the microwave to get them piping hot again. 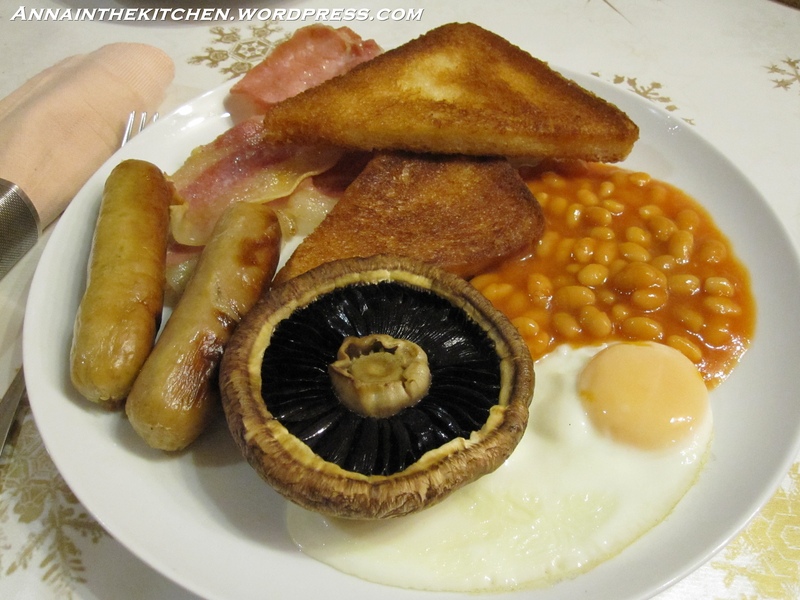 – Everything is ready when the sausages are nicely browned all over and cooked through, the eggs are set, the bacon is soft with crispy edges, the mushroom is tender, the bread is a light golden brown and the beans are hot! – Plate up and eat! This “recipe” of course is open to as much variation as you want to give it. Don’t like something? Leave it out. Like your eggs scrambled? Scramble them! Only got little sliced mushrooms? Pan fry them in a small saucepan in a little butter. It’s your breakfast, enjoy it!